Not all JNT skiers continue cross country ski racing after high school or college, but many pursue diverse athletic interests. I would like to think the basic training principles learned in the JNT are valid in other endurance sports. 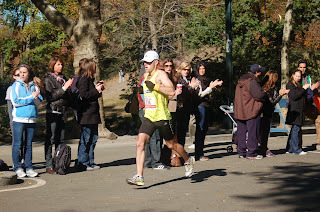 I had a chance to watch two former skiers in the New York City Marathon Sunday, Nov 6. Impressive results from both: Stephen Donahue, 59th overall, 2:32:25 and Megan Kelly, 283rd overall, 3:04:58. During lunch with Stephen after the race, I asked him for his reflections. After a half dozen marathons, Stephen noted he was better able to pace himself and not lose a lot of energy before and during the early stages of such a long race. 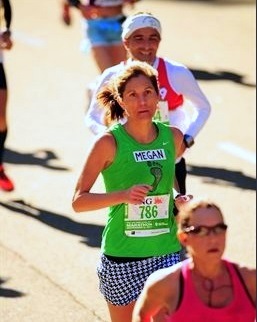 Practice makes perfect, even for 26 mile events. But I do remember how nervous he would be prior to a cross country ski race as a JNT member. Obviously he has learned a few things over the years – one of the primary goals of the program (sport for life).